In this episode, Emily interview Dr. Gary McDowell, the executive director of Future of Research. Future of Research is an advocacy organization that uses data to empower early-career researchers. Gary outlines the ongoing work at Future of Research before diving into the details of their recently published study on postdoc salaries. Emily and Gary discuss the complexities around categorizing and counting postdocs as well as the interesting results from the data Future of Research acquired by Freedom of Information Act requests. 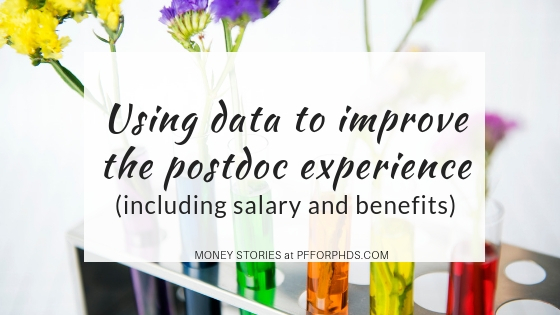 Current postdocs can contribute to this ongoing project by submitting their salary and benefits data to the Postdoc Salaries database. Dr. Gary McDowell is from Northern Ireland and Scotland. All of his undergraduate and postgraduate education was completed in the United Kingdom. He moved to the United States to become postdoc. First, he worked at Boston Children’s Hospital, then he worked at Tufts University in the Boston area. As a postdoc in the United States, Gary became interested in the scientific system itself, such as setting scientists up for success and producing scientists, not just science. He experienced the frustration that many people feel with the scientific system and its hyper competition. Now Gary is the executive director of the nonprofit Future of Research. Their mission is to empower early career researchers with evidence to help them change the research system and the enterprise they experience. 3:00 Can you give us an overview of Future of Research and the organization’s work? Gary is the only staff member of Future of Research. The board of is comprised of twenty early career researchers. The organization originated with a conference to bring early career researchers together to discuss ways to reduce hyper-competition in biomedicine. They held conferences around the country and realized the need for a group that has these conversations. The nonprofit provides data and evidence to early career researchers to help them make better choices and to educate the rest of scientific community of the realities our generation is currently experiencing. Their work is done by the board and volunteers. Future of Research has worked on two major projects which came out of local meetings. The project “Who’s on board?” aims to get more early career researchers into leadership positions, starting with scientific societies. Through this project, Future of Research seeks to generate a network of future leaders for scientific organizations to tap into. They are working on a project to address mentoring, because it is one of the biggest concerns of early career researchers. Junior faculty often ask, “How do I find out more about how to mentor and manage people?” Junior faculty are expected to be mentors, but don’t know how to. Future of Research will host a summit in Chicago to bring together people who work in this space and who research mentoring. They will discuss what grassroots action they can take to make sure institutions are putting mentoring at the center of their interests. Future of Research has been responsive to needs that arise. They are beginning a project to examine peer review and address this phenomenon of grad students and postdocs essentially ghostwriting a peer review report that is then submitted to a journal under someone else’s name. This is a problem of appropriate scholarly recognition, but at the same time the academic community hears there are not enough reviewers. Journals are crying out for more reviewers, but there is lack of transparency about who’s doing reviews, creating barriers to journals having names of potential reviewers. Surveys suggest that principle investigators are not trained in peer review, their practices come from assumptions, and there is generally lack of clarity of expectations in the peer review process. Future of Research has just finished a postdoc salary project. It started when they formed the nonprofit. At the time, there was a change to federal labor law being proposed. The change was going to affect postdocs by raising their salaries, or by causing institutions to have postdocs clocking in and out and tracking time. Future of Research watched the push to raise postdoc salaries, and started following what institutions would do in response. They had the question about what are the actual salaries that people in postdoc positions have? 8:34 What is your recent paper and where can people find it? The title of their paper is “Assessing the landscape of U.S. postdoctoral salaries.” It’s open access in the Studies in Graduate and Postdoctoral Education, Emerald Insight Publishing Groups. 9:07 What is a postdoc? According to Gary, the PhD is when the trainee is learning how to do science, how to carry out research, how to do experiments, and analyze,. The PhD is for learning the nuts and bolts of being a scientist. The postdoc is intermediate, after the PhD and before the professor position. Gary’s opinion is that a postdoc should be considered as a period when you should be thinking about your own research goals and how to take those foward. Postdocs should be learning under the mentorship or apprenticeship of an investigator. Postdocs should be learning how to manage a group, mentor people, manage budgets, write grants, and lead a team. However, Gary says that the postdoc is more likely a period of further research. Many people change field and get experience in another research group. Postdocs are often trying to get a certain number of published papers. Postdocs are trying to demonstrate they can succeed in a different lab and accrue credentials to get a faculty position to start as a professor. Emily adds that there are eleven different common titles under which postdocs can be hired. There is a discrepancy between how employers see postdocs and how postdocs see themselves. What level of awareness do universities have around their own postdocs? 11:55 How was the idea for a project to assess postdoc salaries formed? What question were you asking? When the team at Future of Research was looking at policies that were being updated in response to labor law, they realized that these policies at an institution don’t tell us necessarily what people are getting paid. Though the institution has a policy about postdoc salaries, actually paying postdocs that amount requires adherence to policy and someone following up to enforce policy. The team saw a pre-print paper by Rescuing Biomedical Research, another nonprofit, which looked at National Science Foundation data on number of postdocs and concluded that the number of postdocs in decline. They questioned whether there is truly a decline, or instead a bubble of people staying in postdoc positions for longer. These questions led them to start the project to collect data on postdoc salaries. The team at Future of Research found that institutions are doing a terrible job of reporting year to year how many postdocs they had. While institutions were receptive to policy changes, if the institutions don’t know who the postdocs are to begin with, will people fall through the cracks? Will the policies actually be reflected in reality? The institution could recommend salary, but never follow up. Institutions are also in a constant argument over whether postdocs are employees or trainees. Unfortunately, it seems postdocs are employees when it suits, such as when the institution needs to keep postdocs out of things they need to do for students, but postdocs are trainees in terms of lower salaries and receiving no benefits. 14:18 What position counts as an employee or not an employee? Gary explains that whether a position is designated as an “employee” is complicated by where the money comes from. Postdocs may be “staff” on a grant, or postdocs may be on fellowships of various kinds. When postdocs are on fellowships or paid directly, they are usually referred to as trainees, typically lose benefits, and the institution says they are no longer an employee. The U.S. Department of Labor created a specification about who is an employee, specifying that it’s not who pays you, it’s the nature of the work. The Department of Labor made this specification because some institutions tried to designate postdocs as fellows to get out of the new labor law. The Department of Labor explicitly sent this message to the National Institutes of Health, stipulating that the NIH had to raise fellowship stipend under the new law. 17:08 What did you do for the postdoc salaries project? The team from Future of Research wanted to analyze postdoc salaries, but they learned that this information was not easy to find. They carried out Freedom of Information requests at public institutions. They contacted the Freedom of Information or Public Records offices at public institutions, which were legally required to give out data like this. They asked for the position title and salary of everyone who was a postdoc, on date of December 1, 2016 when the new labor law was due to come into effect and changes were likely to happen. This method forces the institution to provide information, and this method served as an internal metric of whether universities know what postdocs are. Certain institutions didn’t know what a postdoc was, and asked Future of Research to explain what a postdoc is. Future of Research cross checked the information they received from Freedom of Information requests with the National Science Foundation data on postdoc numbers. 20:05 What was your analysis of the data from public institutions? Future of Research had a data scientist on the team, who analyzed the distribution of salaries. They brought out patterns by geographic region, by gender, and by title. They examined what variables were affecting the salaries. Their aim was to assess the landscape and figure out what salary distribution looked like. This could set the bar to work from for efforts going forward. 21:07 What were the broad conclusions of the postdoc salaries project? Was there anything surprising to you? Gary says they got broad distributions of postdoc salaries. Nature published a write-up that emphasized that postdoc salaries vary wildly by institution. Most people received between $40,000 and $49,999 annual pay. They found that 22% of all their data was within a $25 range around the new National Institute of Health minimum stipend, which was very close to the proposed salary threshold is under the federal labor law. Gary shares that when Future of Research considers the levers they need to pull to raise postdoc salaries, it is a very useful finding that the median salary of all postdocs across the US, regardless of field, was pegged to minimum NIH National Research Service Award stipend amount. The most effective policy lever for raising postdoc salaries in the U.S. is to get NIH to raise the NRSA award stipends. Emily emphasizes that so many universities go off the NIH minimum salaries, even though it’s just a recommendation, and it’s just a minimum. She points out that this minimum doesn’t take into account different cost of living. Is this the minimum for Bethesda, Maryland, where the NIH is located? Institutions go off this as if it is absolute truth. Gary brings up that in December 2018, NIH raised minimum salary. Now the minimum is $50,000, this amount has been recommended for quite some time. Gary and Jessica Polka, president of Future of Research, are on the National Academies study for the Next Generation Researchers Initiative. They will be releasing recommendations informed by this data. Gary was surprised by how many salaries were in the $50,000 range. They broke down the distribution by field for a large subset and found no real field dependence for the salaries. People would expect the humanities to be lower, but the humanities were not lower. Gary was surprised by how often biomedical engineering salaries were in the lower end of the distribution. Gary wonders who negotiates, and if there’s a disparity in who’s negotiating. He mentions that talking about money in academia is stigmatized. Emily created the website PhD stipends with her husband. Now it has over 4000 entries in it. It is a great place to go for prospective graduate students. She has thought there should be the same resource for postdocs. They have started postdocsalaries.com for people to self-report their salaries. Future of Research obtained information from public institutions, but they are completely missing private institutions. Self reporting also provides a check on whether what the institution reports matches what postdocs report. Postdocsalaries.com is a useful self reporting tool, that helps other people compare salaries and gives them the opportunity to comment on issues. Gary discusses that when he gives a talk at institution, he loves to bring up money. He wants to break the stigma that ‘we’re not supposed to talk about this’ and tell people that this should be one of the questions that you ask your prospective PI. Gary says how that question is answered will tell you a lot about the PI as a person. You should look for someone who responds “I would love to pay you more, we can look into fellowships or I can find opportunities to pay you extra,” and steer clear of potential advisors who say “This isn’t about the money.” This is part of gathering information for your decision. 37:08 What are some action steps that postdocs can take today to improve their salaries, benefits, or working conditions? Gary says always having data at hand is useful for individuals and groups to advocate. With data, you can approach an institution with the salaries that people are getting in your field, and point out that this is what the policy says so this is the expectation. This is action you can take on the personal level. When Future of Research compared institutions publicly, there were administrators who could now use the data to say that the institution is being compared to everyone else, if they want to be competitive for postdocs they need to raise postdoc salaries. For groups looking to push for change in an institution, there are a number of lines of evidence. Gary says that comparing with peer institutions is useful. The most recent recommendations are that postdoc salaries should be at least $50,000 then adjusted for cost of living, then for your years of experience. Listeners should go to postdocsalaries.com to get involved and learn more. After a long, arduous journey through graduate school, you’ve successfully defended your PhD and are about to take the next step in your research career: a postdoc. One of the best perks of transitioning from being a graduate student to a postdoc is the pay increase. While postdocs aren’t exactly rolling in dough, they are usually paid significantly better than graduate students, and after 5+ years of zero to tiny raises, it’s gratifying to finally receive a higher salary. 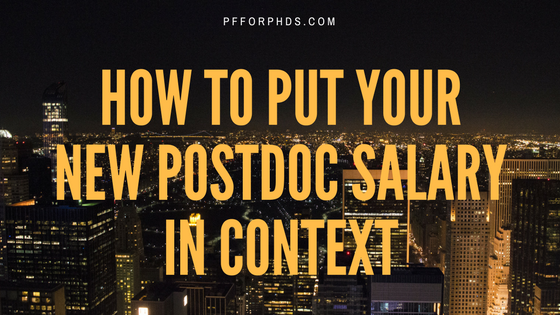 However, before you buy that new car or put an offer on a house, take some time to put your new postdoc salary offer in context. There are a few subtle changes common to the grad student-postdoc transition that will decrease your take-home pay and/or discretionary income. The very first question to clarify is what exactly your employment status will be with respect to your university/institute. Just like in graduate school, there are two broad ways you can be paid: compensatory or non-compensatory. In academic-speak: Are you an employee or a fellow? If you see “fellow” in your title or offer letter, have heard “fellowship” from your advisor when discussing funding, or have won an outside individual fellowship, you are a fellow and not an employee of your university. As a fellow, you may receive no benefits from your university or only a few; you are almost certainly not going to receive all the benefits a full employee would. You should contact your university’s postdoc office or your departmental administrative assistant for a full explanation of your benefits. If you aren’t labeled a “fellow” you are most likely an employee, but there may be multiple classes of employees at your university so it’s important to determine which one. (Postdocs may not be offered the same benefits as faculty, for example.) Once you know exactly your class of employee, you can read through material provided by Human Resources to determine your benefits, and direct any questions you have to Human Resources or the postdoc office. When in doubt, ask if you will receive W-2 pay or not. W-2s are use for employee pay, while non-compensatory pay is not reported to the IRS or reported on a 1099-MISC. Some of the common, though not universal, differences in benefits offered to employees though not fellows are: income tax withholding, 403(b) access, 403(b) match, subsidized health insurance premiums, health insurance premiums paid as a payroll deduction, Health Savings Account/Flexible Spending Account, group disability and/or life insurance access, and official paid time off. If you’re earning more as a postdoc, you’re also going to pay more in federal income tax (given no other changes in your personal life). Your effective tax rate will increase and possibly your marginal tax rate as well. So if your gross pay increases by $1,000 per month, for example, federal income tax may take a $120 or $220 (or somewhere in between) bite out of that increase. The same broad story would be true for state taxes if you are not moving states, but many postdocs relocate states as well with their new positions. If you don’t want any surprises in your first paycheck, look up how your new state’s tax brackets and rates compare to your old state’s. One of the biggest tax changes that occurs when going from a grad student to a postdoc is FICA tax (Social Security and Medicaid). As a graduate student, you did not pay FICA tax. Postdoc fellows will also not pay FICA tax (or self-employment tax) on their income as they do not technically receive “wages.” However, postdoc employees will begin to pay FICA tax. On the employee side, the Social Security tax is 6.2% and the Medicare tax is 1.45% on all of your income up to $128,400 (in 2018). If your new postdoc salary is $45,000 per year, for example, you will pay $3,442.50 in FICA tax. That can be a big shock for someone who wasn’t paying any tax in that category previously. Further reading: Why Is My Take-Home Pay as a Postdoc Nearly the Same as When I Was a Grad Student? While your grad school and postdoc universities almost certainly offer you the option of buying group health insurance, who pays the premium and how might change. As a graduate student, it is typical to have your health insurance premium paid partially or completely from funds that are not part of your stipend pay, so many graduate students don’t have to factor that cost into their take-home pay. A postdoc employee will likely pay part or all of his insurance premium through a tax-free payroll deduction. A postdoc fellow’s insurance premium may be paid on her behalf, similar to a graduate student, or come completely from her salary. This is an important benefit to check into prior to starting your postdoc position as you don’t want any lapse in coverage or to be surprised by the additional expense. The premium for a postdoc’s insurance may be much higher than a graduate student’s, depending on the risk pool each position is put in. Another big change when you transition out of being a student is that your student loans, if you have any, are no longer eligible for in-school deferment. Beginning to pay off student loans can be a large monthly expense on a postdoc salary, depending on the total amount owed. Contact your lender(s) to find the minimum payment due and the period over which you will repay your loans. Federal student loans have a standard repayment period of 10 years, but private student loans may take a shorter or longer period of time. Factor this minimum payment due into your planning for how to allocate your salary. If you want to pay off your debt faster than the standard repayment period, which is an excellent idea for debt at a moderate or high interest rate, plan on paying more than the minimum amount due each month. If you don’t think your postdoc salary can handle even the minimum payment on your student loans, you have two options to immediately consider. 1) With respect to your federal student loans, you may be eligible for one of the many repayment programs that lower your minimum payment due (even, potentially, to $0) by extending the repayment period and overall amount of money you will repay (income-based repayment, pay as you earn, etc.). Your eligibility for these programs depends on your household income. Carefully consider whether it is in your best interest to use one of these programs, even if you are eligible. 2) There are many lenders currently offering student loan refinancing at competitive interest rates. When you refinance, you are paying off your old loans and taking out new private loans, so make sure you would not be losing any benefits unique to student loans, such as the repayment programs for federal student loans. Be forewarned that these lenders only work with borrowers with excellent credit and low debt-to-income ratios. If you can significantly lower your interest rate, refinancing may be a positive step for your personal finances, both lowering your minimum payment due and reducing the total amount of money you will repay. With a change in university naturally comes a change in the local cost of living. As you well know, living expenses vary greatly from city to city. At the lower salary levels of a graduate student or postdoc, this can be a major concern. There are two quick methods to estimate how the cost of living will change between your grad school city and your postdoc city. CNN offers a cost of living comparison calculator. Plug in the two cities in question (or as close as you can get to them) and put in either your grad student salary or your postdoc salary. Your greater familiarity with the cost of living in your grad school city combined with this calculator will help you estimate how far your new salary will go in your new city. MIT’s living wage database also provides insight. Look up the living wage for your grad school university’s county and your postdoc university’s county. The living wage will be closer to your grad student salary than your postdoc salary, but the difference between the two will also help you determine how much of an increase or decrease in cost of living you will experience. A more involved but also more effective step if you have not yet moved to your new city is to sketch a budget. Using your best estimate of your take-home pay based on the above factors, research how much you are likely to spend on housing, food, transportation, etc. if you kept your perceived lifestyle the same from grad school into your postdoc. Ideally, this exercise will help you decide in which areas of your budget you are able and would like to upgrade your lifestyle, such as living without a roommate. My husband stayed in his PhD advisor’s lab for an extra year as a postdoc to finish up a few papers before applying for a “real” multi-year postdoc at another institution. My husband received one postdoc offer that he seriously considered before ultimately choosing a position in industry. We performed the calculations above regarding increased taxes and insurance costs to compare the take-home pay of his new postdoc offer directly to the take-home pay from his short-term postdoc and graduate student positions. The take-home pay from the postdoc offer was slightly less than that of his short-term postdoc position and much higher than his pay as a graduate student. However, when we compared the cost of living in our grad school city, Durham, NC, to the cost of living in Boston, MA, where the new offer was from, we were shocked by the results. In terms of the effective purchasing power from my husband’s take-home pay, the pay for the postdoc position in Boston was “less” than even his grad student pay in Durham. We would not have expected to experience an effective pay decrease moving from a grad student position to a postdoc position, but that is how the numbers worked out. I’m very glad that we took the time to do those estimates before he made a final decision about the offer. While the gross pay from your new postdoc position may seem great in comparison with your grad student pay, don’t be fooled! You must account for several important changes in taxes, benefits, and cost of living to compare apples to apples.